I live in Dublin, Republic of Ireland and I was hired on the 21st March 2017 on the agreement of 3 months probation review to see how well I perform and if my performance was satisfactory then I will be given a permanent contract however my manager has been trying to get rid of me due to personal reasons, making my performance an excuse to terminate my employment. My manager hardly speaks to me and all communication are done via the assistant manager. On my probation review day, 21st June, I had a brief talk during my lunch with the assistant manager and he told me that the manager would like to extend the probation period by another 3 months to see how well you get on and if your performance is satisfactory, only then you will become permanent. I agreed to that and continued. Your employment began on 22nd June 2017 and no previous employment counts as part of your continuous period of employment. Your employment is temporary and is expected to end on or before 21st September 2017. The Unfair Dismissal Acts 1977-2007 will not apply where the only reason for ending the contract is the expiry of the fixed term, or the completion of the specified purpose. 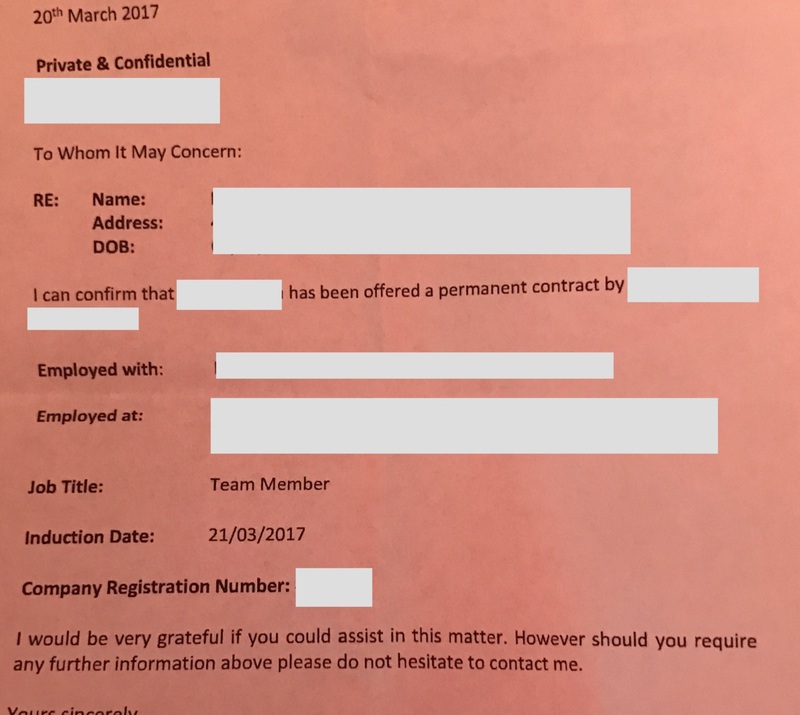 I have attached the old employment proof which proves that my induction date was on the 21st March 2017. I have also attached the new contract paper of 2 pages. If you refer to the old attached file, it clearly states that my induction date was 21/03/2017, meaning that I am already an employee and the new contract paper states that my employment began on the 22nd June which is absolutely incorrect. This new contract does not meet the conditions that were set on my probation review. 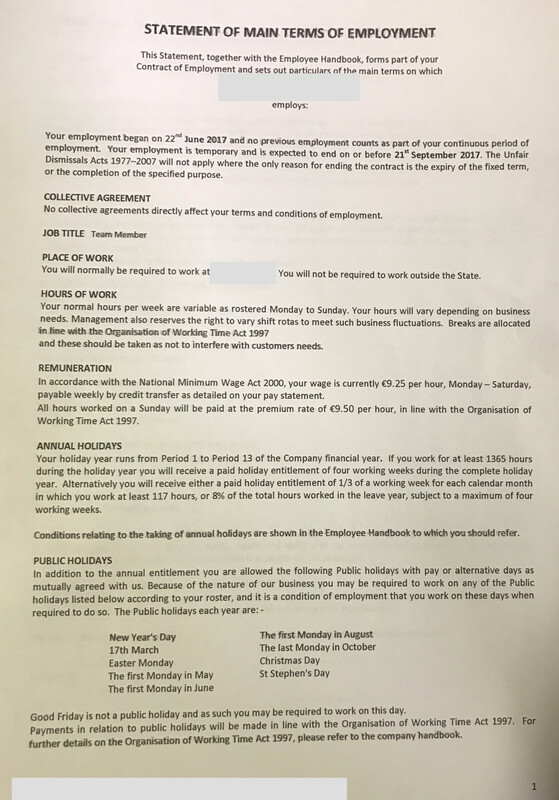 Also, by signing this contract and if I understood it correctly, it would mean that I was only hired for 3 months and therefore this will have an affect on my paid holiday entitlement as I will be considered an employee who worked for 3 months even though on the 21st July, it will be 4 months. This new contract does not seem to make any sense at all as it will be undermining my paid holiday entitlement and I will get paid holidays only for 3 months rather than 6 months at the end of the contract and I am definitely sure that a lot of work ethics rules are being broken here as well as Organisation of Working Time Act, 1997 is being violated. I would like to know if I am right in any case regarding this and what I can do? Shall I sign it away? What can I say to the manager or the HR to persuade them to alter this contract? Or is it that I do not have any choice but to sign it any way? Also, by legal means how long do I have until I sign this contract paper? I would recommend talking to an adult person in HR. I'm quite sure they will notice that what your manager wants to do is more than dodgy, and doing something dodgy may be in the interest of your manager, but not in the interest of the company. The best thing is to go to HR, acting as if a mistake has been made, and point out to them what your start date was, and that the new contract has the incorrect starting date, and they need to fix this mistake or you can't sign the contract. If they insist you sign it, then you DON'T sign it. If they say you will be fired if you don't sign it, then you tell them that in that case you would get legal advice. BTW. You definitely don't sign this as it is. PS. This answer was posted on workplace.stackexchange, not law.stackexchange, so please don't complain if there is no legal content. Not the answer you're looking for? Browse other questions tagged contract-law contract european-union ireland or ask your own question.